This correspondence concerns the use of convicted criminals as soldiers in the U.S. military. Mrs. W.A. 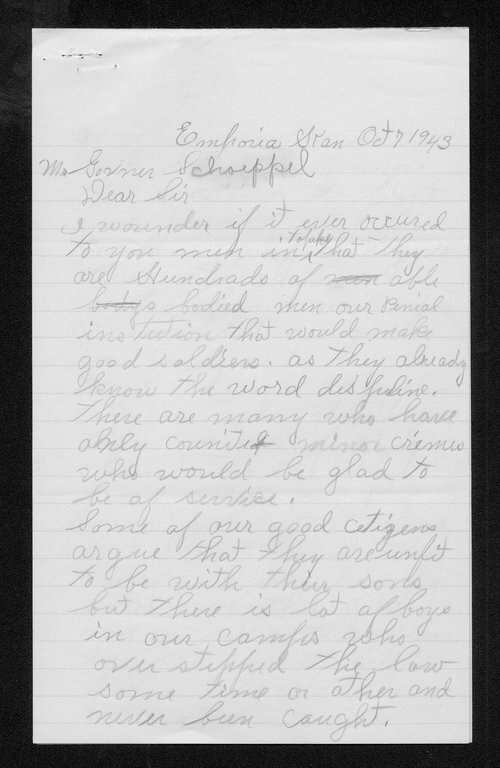 Chambers asks Governor Schoeppel if he had considered using convicts as soldiers because they "already know the word discipline." Governor Schoeppel's secretary W.F. Turrentine responds by explaining that such men have already been accepted in the military and granted a military pardon in exchange for their service during World War II. This item can be used to provide students with some insight into the home front during World War II. In particular, this correspondence demonstrates that all avenues of manpower were explored during the conflict.